"An accomplished storyteller, puppeteer, and children's librarian, Lucia M. Gonzalez started her career in library services to children in 1987 after receiving the Bachelor of Arts Degree in History from the University of California, Santa Barbara and while pursuing her Masters in Library Science at the University of South Florida. Lucia is the author of two award-winning bilingual books, The Bossy Gallito (Scholastic, 1994), winner of the Pura Belpré Children's Literature Honor Medal and among New York Public Library's 100 Picture Books Everyone Should Know, and Señor Cat's Romance and Other Favorite Stories from Latin America, an Americas Award Commended Title. Gonzalez was named the Jean Key Gates Distinguished Alumni by the University of South Florida School of Library and Information Science for 1998. Gonzalez's new book, The Storyteller's Candle, is a bilingual picture book illustrated by Lulu Delacre and published by Children's Book Press (Spring 2008)." 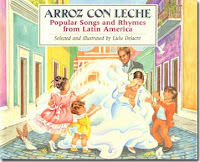 "Lulu Delacre, born in Puerto Rico to Argentinean parents, has written and illustrated many beloved books for children, including Horn Book Fanfare Book Arroz con Leche: Popular Songs and Rhymes from Latin America and Salsa Stories, an IRA Outstanding International Book. The Bossy Gallito and Arrorró mi niño: Latino Lullabies and Gentle Games are winners of the Pura Belpré Honor Medal for Illustration. Rafi and Rosi, and Rafi and Rosi: Carnival! are selections of the Junior Library Guild. The Storyteller's Candle and Alicia Afterimage, scheduled for 2008, are her latest books. A common thread in the artist's work is the celebration of her Latino heritage. "The author-illustrator has exhibited in Paris and in Puerto Rico, New York, New Hampshire, Connecticut, Maryland, and Washington D.C. A graduate of L'Ecole Supérieure d'Arts Graphiques in France, she has lectured throughout the United States. Owners of her art include Keene State College, New Hampshire; The Kerlan Collection, Minnesota; Mazza Gallery, Ohio; and individual collectors in Canada, France, and the United States. "Lulu is a grantee of the Arts and Humanities Council of Montgomery County, Maryland, and has been honored as a Maryland Woman in the Arts and a Write from Maryland Author. Lulu lives with her family in Silver Spring, Maryland, since 1988." What first drew you to youth literature as a career? LG: I've always been fascinated by the folktales of other countries. LG: It was while living in Venezuela that I came up with the idea that would lead to my books for children: I realized that many of the folktales, children's folk songs and games there were similar to the ones I had grown up with, with only slight variations. LG: Since then, my dream became to compile some of the most popular stories told to children throughout the Americas and retell them in English, so that I could pass them onto our children in the U.S.A.
LG: My profession as children's librarian allowed my dream to come true. I was enchanted by all the wonderful children's books that were part of my everyday work. I realized that there were many books that needed to be written and many stories to be told. LD: Since grade school I was happiest when drawing or painting. Growing up in Puerto Rico, I did not have access to children's books other than some paperback fairy tales published in Spain, and, therefore, I did not know that real people could write and illustrate children's books. LD: After studies at the University of Puerto Rico, I decided to go to art school, in Paris, in the hopes of becoming a graphic artist. One day, at lunch time, while my classmates where in the corner cafe, I went into the American Gallery next to my school. 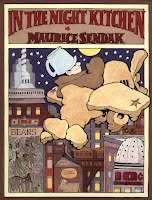 The original art of In the Night Kitchen by Maurice Sendak, was on exhibit. LD: Standing in front of Sendak's artwork, I had a revelation. I would become a children's book illustrator. I knew that was my path. Many years later, I discovered I could write my own material as well. Could you tell us about your apprenticeship as children's book creators? What helped you the most? What might you do differently, given the opportunity? LG: My professor from Library School, Dr. Henrietta Smith, editor of the Coretta Scott King Awards Book, has been my mentor in the field. Her Children's Literature and Storytelling classes provided me with my frame of reference for the books I wanted to write. As a storyteller, I tell before I write. The audience is my first editor. LD: What helps me the most is to follow my instincts. I create the books I do out of love and the firm conviction that they are needed. When I illustrate another author's manuscript, I let the story dictate the media and style of the art. I find tremendously helpful to learn directly from the author what his or her vision is. Then, I go on to add, expand, and enrich the text as best as I can, being faithful to the spirit of the manuscript. LG: My first job as children's librarian was programing that aimed at promoting libraries and reading through the art of storytelling. My job was to visit schools every day in the morning and to research stories in the afternoons. It was then that I started telling my own version of stories from Cuba and how I also became a published author. LG: Scholastic was publishing a book on American folklore and searching for Cuban-American stories. I submitted my first two stories for inclusion in this anthology. One of those stories was The Bossy Gallito. The editor loved the story so much that she asked me if I wouldn't mind publishing it as a stand-alone picture book illustrated by Lulu. Imagine my surprise. LD: After I graduated from art school, I married and I established myself in the United States. I remember that in 1982 I took bus from Ayer, Massachusetts; to New York City. I had made twenty-two appointments to be held in a period of five days at children's book publishers. I had two portfolios with me, one to leave behind when the art director would not see me, and one to show personally. LD: This happened before the Internet, when finding the list of publishers required a visit to the library and making appointments required multiple long-distance phone calls. LD: I stayed at the YWCA in a tiny room without a bathroom, it was cheaper. I went to my appointments dressed in a navy blue suit, as my mother had told me a proper young lady should do. I still remember an art director asking me if I was the artist or the agent and leaving that office mildly offended. LD: Even though I did not dress the part of the artist, I got my first assignment for illustrations on Sesame Street Magazine by Friday of that week. Since then, I have been lucky and persistent enough to keep publishing. LD: There are projects that are harder to launch. There are projects that never see the light of day, because frankly, they are not worth it. All in all, I am very grateful to have been able to create books that children love. I have illustrated thirty-two books, of which I am the author of sixteen. 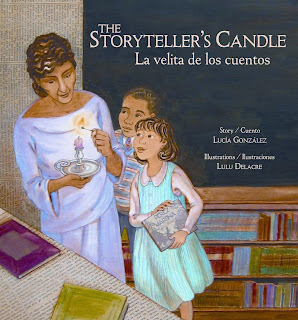 Congratulations on the release of The Storyteller's Candle/La velita de los cuentos (Children's Book Press, 2008)! Could you tell us a bit about it? LG: I wrote this book to the memory of Pura Belpre, a devoted and talented librarian, author, and storyteller who became, in 1921, New York Public Library's first Puerto Rican librarian. LG: I was inspired by New York Public Library's storytelling tradition and the visionary children’s librarians who were pioneers in providing services to immigrant families and who understood the importance of honoring the immigrants' languages and preserving their stories. LG: I was approached by Children's Book Press to write this book in early March 2006. By the first week of the following month I was on my way to New York City to start my research. LG: From the moment I arrived in New York, everything happened by serendipity. LG: I stayed at the YMCA in Harlem because I couldn't find another affordable place at the time. As I walked out of the YMCA the next morning and asked for the nearest NY Public Library, a man that was leaning against the dark brick wall pointed across the street. There, across from the room where I stayed, was the Schomburg Library, the first library where Pura Belpre worked in 1921. LG: My heart pounded with emotion when I entered the place where Ms. Belpre first told the story of Perez and Martina to an eager group of children by the light of the storyteller's candle. LG: It was a dream come true to be given the opportunity to write the first book about Pura Belpre. From the beginning, I knew I wanted to concentrate on the impact of her work on the lives children attending her programs at the library. LD: I met with Lucia on a trip to Miami in the summer of 2006 to talk about the initial manuscript. We had a great meeting where we brainstormed about the story and I tried to visualize it. She brought part of her research material to the meeting and later took me to her home where she shared the puppets she had made in the style of Pura Belpre's. LD: I remember asking Lucia to write in her story the sounds and smells that I couldn't paint. I believe we make a good team. Once I had the final manuscript, I spent about five months working on the book's art. What were the challenges (literary, artistic, research, psychological, and logistical) in bringing it to life? LG: In order to write this book, I dedicated weeks to doing original research. I visited the various library branches where Pura Belpre worked, spoke to people who knew her, spent days listening to her voice telling stories, perused through original letters written to her by children who attended her programs, as well as letters written by Pura Belpre herself. LD: I loved the challenge this book offered. It is the first historical fiction picture book I illustrated. I wanted to set the book in the context of its time and place, the 1930s. LD: One obvious way was to depict accurately vehicles, buildings, clothing and objects like stoves, cash registers or food cans. Another way was to imitate the sepia photos of that time. However, I wanted to go beyond those expected methods of placing the story in its proper context. LD: Since the story is set in Manhattan, and a way to know the times is by the news that year, I went in search of the issue of the New York Times of the 6th of January of 1930, a date very relevant in the story Lucia tells. To my amazement and delight, I found a rare newspaper outfit from which I bought the specific issue. What advice do you have for beginning picture book writers and illustrators? LG: My advice would be: always write from the heart, don't preach, trust your story, and be knowledgeable of the literature. LD: Be persistent, listen to your inner voice, write from the heart, or draw and paint what has meaning for you. As a still developing writer, I find it is extremely important to read aloud what I write, to listen to others' opinions on my writing, and to read good literature constantly. LD: As an illustrator, I always have a small journal with me, where I can make quick sketches and keep my skills honed. I used to look at what other illustrators did when I was younger; now I just follow my instincts. LG: I spend much of my time with my son and my family. We go to the movies a lot and to the beach. LD: I travel a lot. I enjoy getting to know other countries, their peoples, and their cultures. I love to garden, to cook, to entertain and nurture my friendships. LG: I am not sure of where my stories will take me next. LD: Alicia Afterimage (Lee & Low, 2008) a young adult novel based on a true story. The book is a portrait of Alicia, who died in a car crash, seen though her friends eyes. LD: It is also an exploration of teen grief, and an account of how a community changes and heals over a period of two years.